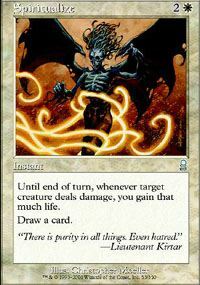 Until end of turn, whenever target creature deals damage, you gain that much life. Draw a card. Enchanted creature gets +1/+1 and has protection from enchantments. This effect doesn't remove Tattoo Ward. 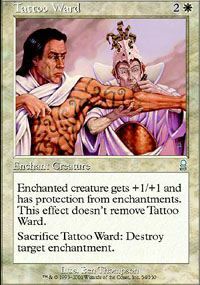 Sacrifice Tattoo Ward: Destroy target enchantment. 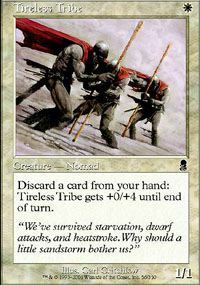 Discard a card from your hand: Tireless Tribe gets +0/+4 until end of turn. Attacking doesn't cause Wayward Angel to tap. 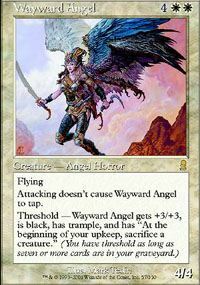 Threshold - Wayward Angel gets +3/+3, is black, has trample, and has At the beginning of your upkeep, sacrifice a creature". 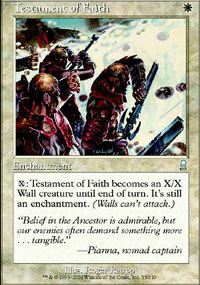 (You have threshold as long as seven or more cards are in your graveyard.)""